I am beginning a new tradition of poetry prompt Thursdays where I will list a poetry prompt for anyone to use and respond to. This is a great way to promote daily writing practice. Writing even a couple of paragraphs each day can help organize your thoughts and concerns and help you start afresh and focused for the day’s work. After the prompt, I will write my own response to get the ball rolling and hopefully coax anybody out of their shell. In regards to your own response, feel free to use any form you wish, whether it be poetry or prose and don’t feel pressured to share your work. I encourage sharing, but everyone has their own comfort level and I respect that. Please keep your response between 0 to 500 words; a little more that 500 is ok. If you choose to post your response, please remember, this is a judgment free zone. I encourage discussion about each other’s response, but I expect positive support from everyone who comments. No haters, flamers, etc. Please be respectful of each other. Write about a place that quieted your soul. A place that made you feel small and made you feel a part of something bigger than yourself. I decided to write about the time I was in India. 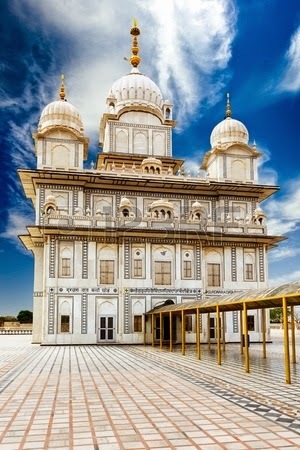 I was in my husband’s home town Gwalior and he and his sister took me to the Sikh temple near Gwalior Fort. The sun had set and yet the white marble temple shone like a beacon in the night. A refuge of quiet amid the chaos of Gwalior. All is loud and dark. The water moat among the shadows. Cold as marble below your feet. Thank you for writing, reading and responding. If you are interested in more prompts or daily writing practice, I also subscribe to the Poets and Writers free and weekly newsletter “The Time is Now.” They send out a weekly email with three writing prompts one poetry, creative nonfiction, and fiction. They also give book recommendations and inspiration.